Why would a train come to the testicles? Our hilltop hotel treated us to breakfast this morning. It was a continental buffet, but much better than that of a hostel! They offered to make you eggs and brought you yummy hot beverages. It was a good start to a day of eating. 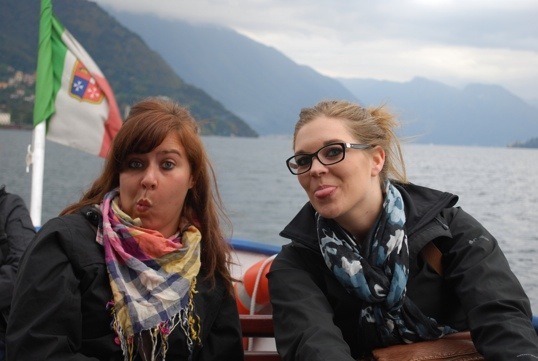 We decided to spend our day at the lake on a boat tour. They have little ferries, both car & purely passenger, that run through the whole of the lake. We bought tickets for the mid-lake section which encompasses five hill-climbing towns (Tremezzo, Leno, Bellagio, Varenna & Menaggio). 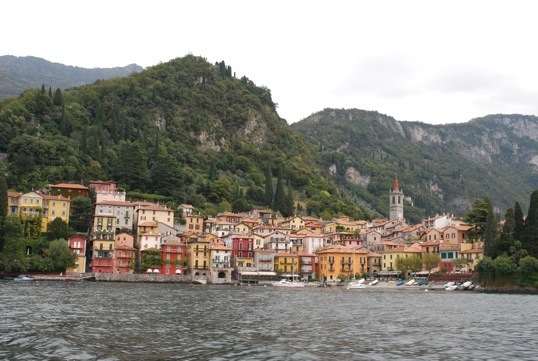 Lake Como is one of the two large lakes in northern Italy. Only an hour from Milan it offers a great escape from the bustling city. 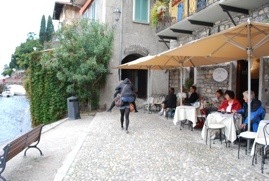 We skipped out on Milan and enjoyed the little towns on Lake Como instead. 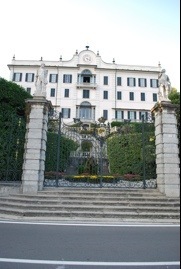 Lake Como is lined with fancy 19th century villas facing the lake. The lake itself is glacier cut (formed and filled with water when the glaciers receded) and reaches depths of more than 1200 feet. We started by riding the whole loop even though our full day ticket would let us work in a hop-on/hop-off fashion. We sat at the back so we were sheltered from the wind but were still outside. This lasted almost the whole time, but it wasn’t the nicest day out so we went inside for the last leg. 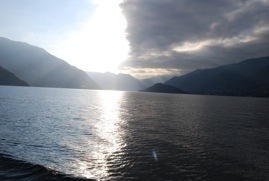 We kept seeing sunshine further up the lake; it just had trouble reaching us. 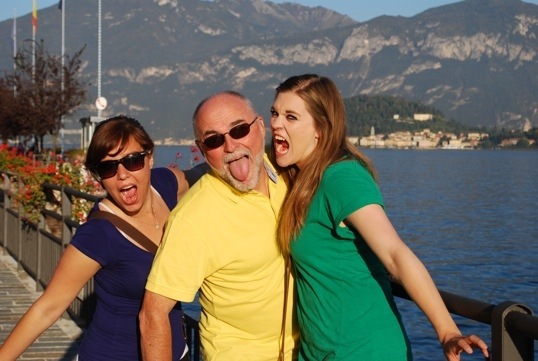 We got off the boat for the first time at Varenna. This small little town is filled with promenades, narrow lanes and restaurants. We made our way through the lake side promenade to the old town. 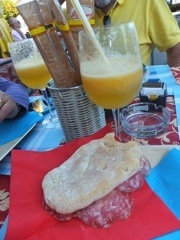 We were greeted by many little restaurants and cafes. Chilled from our boat ride we stopped in for a hot beverage. 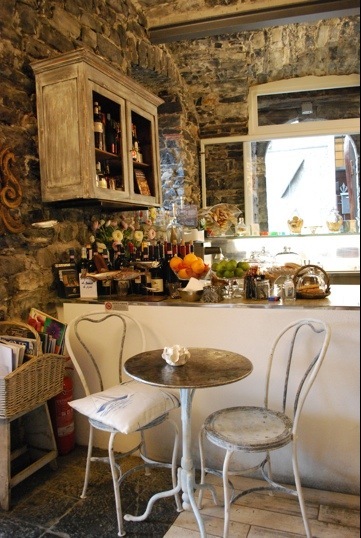 The cafe was sooooo adorable, with great little tables & chairs and a million baked goods in mis-matched cake-savers. 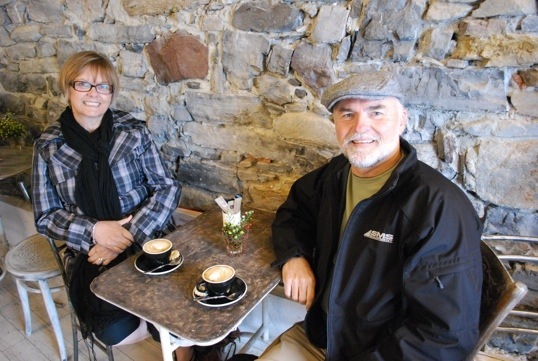 A second cappuccino was just what Justine and Harvey needed today….or any day…they are coffee fiends! 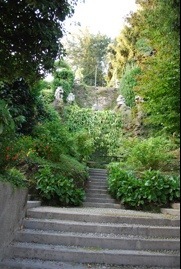 Walking Varenna involved a lot of slopes. We were constantly going up and down, up and down. The ground was also a little rocky at times…like cobblestones with the cement between being too low to allow for a smooth finish. The soles of Justine’s shoes were just too thin and it hurt her feet to walk on it. Being the hero that she is, Kristin decided to carry her over the rough bits. People sitting at the sidewalk cafes got a kick out of this. We joined the cafe crowd for lunch. 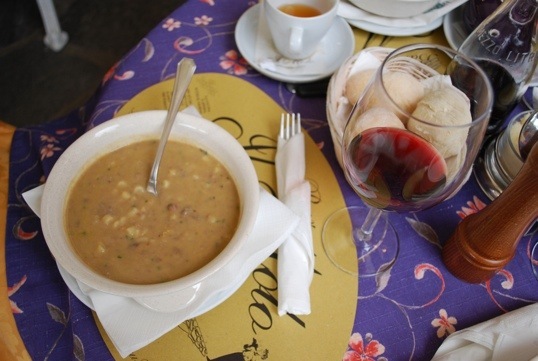 We didn’t need anything too big so we settled for soup…all of us ordered the same thing: bean & pasta soup….with wine…except Kristin, who had tea. This time we took the boat one step back towards our town and got off at Bellagio. Did you know it wasn’t just a casino in Vegas but also a real town? The things you learn when you travel! Ok, maybe that’s not a life changing epiphany but it was an interesting fact. Just glancing at the town as the boat pulled in you could tell why one of Vegas’ ritzyest hotels is named after this lake town in particular. The buildings are bigger and broader and fancier. 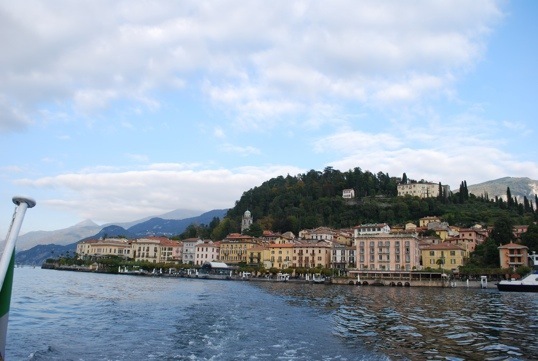 Bellagio is called the “Pearl of the Lake” and this town has 10 times the amount of hotel beds as Varenna. Strolling the streets, there were also many more shops and a higher percentage of tourists then at our last stop. 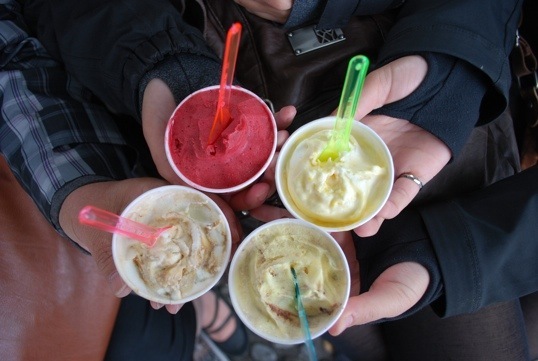 We took this as a sign to do a little shopping 🙂 And then, while we waited for our boat out, we snacked on some delicious gelato…today’s flavors were passion fruit (K), berry (J), caramel (B) and cookie (H). Who are those creepy little men? We picked a restaurant and sat down to eat long before anyone else had shown up. For the record, we also finished before anyone else showed up. Today was just one of those days where you want to eat at a normal supper time like normal North Americans do. 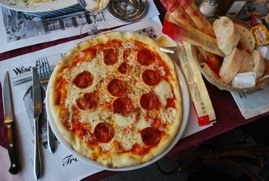 But we still went Italian when it came to our dishes. 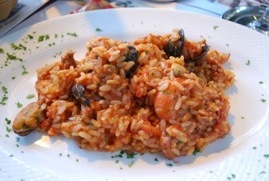 Harvey had a spicy sausage pizza, Bev had seafood risotto, Justine had salmon penne & Kristin had cannelloni. Harvey also ate about twelve packages of breadsticks. As long as we don’t end up back in Switzerland! After an AutoGrill breakfast (you all should have expected that!) we were on the road to Lake Como. 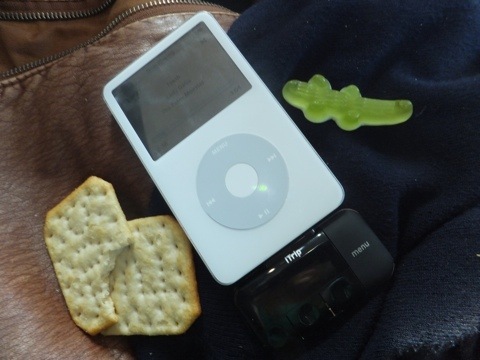 We were all set with the iTrip & roadtrip snacks. Our second AutoGrill stop of the day came a couple hours later in the form of a bathroom break. AutoGrill stop #3 was for gas at about 2 pm. We had planned on an AutoGrill stop number four for lunch, but before we could find a nice big one to eat at we were in Switzerland. Yes, Switzerland. We thought it was the way we had to drive to get to our hotel, but the €40 toll they were asking for us to drive on their roads was a little steep, so we turned around and came back. Our Swiss journey was short and apparently unneeded, as we ended up on the correct road to get to the hotel in the end. Switzerland behind us, we traveled alongside the lake through a variety of quaint little towns. We were unsure of where exactly our hotel was, but once we reached the right town there were great signs pointing our way. The signs lead us up a winding hill (that seems to be becoming a theme for us in Italy) to Hotel Rusall. The hotel is quite nice and our room is a good size for the four of us…it’s the family room, aka the biggest they have. We could have a dance party in the bathroom it’s so big! And the view is incredible. 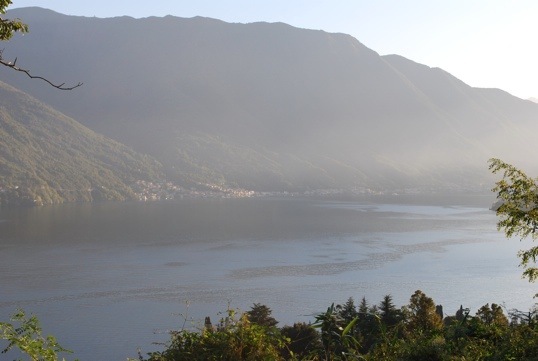 Lake Como is really gorgeous with tiny, hill-climbing towns next to large, bright-stoned villas. We milled around the hotel room until supper. It was hot, but not too hot, and the background of the lake provided a nice place to rest or get things done. 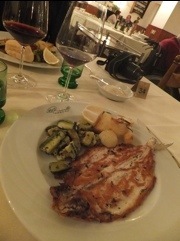 We had supper at the restaurant hotel. 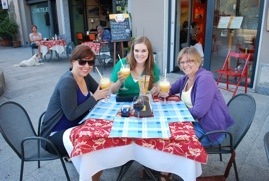 Our late lunch allowed us to have a normal Italian (aka late for home) supper. 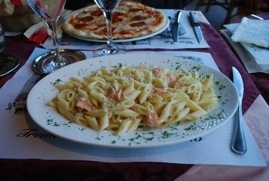 We decided on splitting pasta dishes & meat dishes. Bev & Harvey split the local fish (we ordered salmon first but they were out) that came with zucchini & potatoes and spaghetti with tomato & basil. 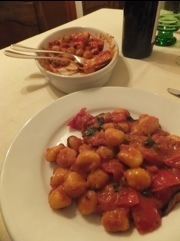 Kristin & Justine split the local fish and gnocchi with tomato sauce. 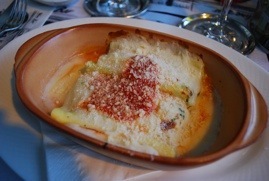 And we paired it all with a nice Italian red wine. It was all so good. 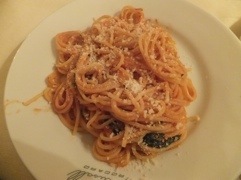 The pasta dishes were huge and bursting with the freshest tomato taste! Yum! Tomorrow we explore the area!